Location: San Jose State University, Student Union – 2nd Floor, 211 S 9th Street, San Jose. Free parking at SJSU North Garage. PCB WEST, the Silicon Valley’s largest event for the PCB supply chain, brings together engineers, designers, fabricators, assemblers and managers to take advantage of unique opportunities to improve skills, increase knowledge and network with peers, colleagues and experts. * PLUS 100+ exhibitors on the show floor! 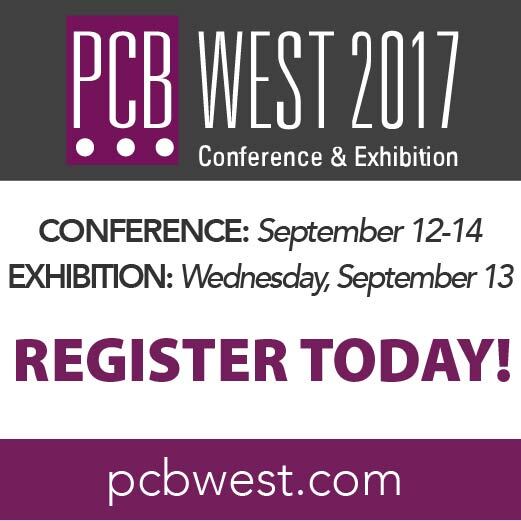 Register today to attend PCB WEST, https://goo.gl/6f3nnL, at the Santa Clara Convention Center, featuring a three-day conference 9/12 -14 (https://goo.gl/Suu3eT) and a FREE one-day exhibition 9/13 (https://goo.gl/EHAPBu). Register for the conference by August 14 to receive a $100 discount. Time-Based Circuits – not just the Single Slope! Subject: Time-Based Circuits – not just the Single Slope! Speaker: Dr. Matt Straayer, Executive Director, Advanced Research and Development, Maxim Integrated Inc.